St. Nicholas Russian Orthodox Church in Cohoes is inviting the Catholic community to the 100th anniversary celebration of St. Elizabeth the New Martyr. On July 1, Archbishop Michael Dahulich will serve the Divine Liturgy at 9:30 a.m.; brunch will follow. At 1:30 p.m., the Akathistos Service (similar to a novena) will be served. There will also be a lecture by Rev. Ilya Gotlinsky, who organizes pilgrimages to Jerusalem to St. Elizabeth’s tomb. At the conclusion of the service, all are invited to participate in anointing with sacred oil from St. Elizabeth’s tomb and to venerate the icon with her relic embedded in it. 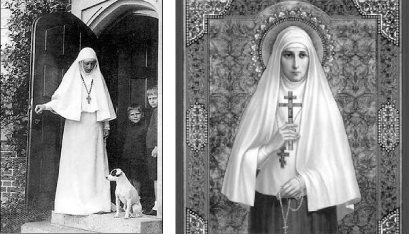 Widowed by an assassin’s attack on her husband in 1905, the Grand-Duchess Elizabeth became a nun and founded a convent devoted to nursing and charitable work in Moscow. In 1918, members of the royal family were thrown into a mine shaft by the Bolsheviks, who wanted to eliminate the Romanovs after the Russian Revolution so no one could regain the thrown. It is said that Elizabeth did not die at first and, when her remains were found, it was seen that she had torn her veil to assist in binding the wounds of others. Her remains were brought to Jerusalem at St. Mary Magdalene Church on the Mount of Olives. She was canonized in 1981. St. Nicholas Church in Cohoes began in 1914 through the efforts of a group of Lemkos, a people who came from an area that is now part of Poland, Slovakia and Ukraine, which was called Lemkovyna. Some descendants of the original group are still parishioners in Cohoes, but the church is now multicultural and less ethno-centric. Now, people attend who come from Belarus, Romania and Russia, as well as converts. The future of the church will come from the new immigration to the United States and those Americans who are searching for a faith and a religious home. Despite the atheistic society of the former Soviet Union, the Soviets were never able to eliminate Orthodoxy, passed down in families. It remained in homes and hearts and, now, people are able to fully express their Orthodox beliefs. In the liturgy, English is the primary language. The Russian Orthodox Church also uses Church Slavonic — an ancient Slavic language — and Romanian. We will use any language, should there be a need for that in the congregation. St. Nicholas Church has parishioners who are African-American and from other non-Slavic backgrounds. After every Sunday liturgy, we serve breakfast, which has become a popular gathering for the people. Our church also holds one of the largest flea markets in the area on the second Saturday in May and third Saturday in September on our property next to Guptill’s roller-skating arena in Latham. This brings the congregation together to prepare ethnic food and make it a family event. St. Nicholas Church has an “icon school” that meets on Tuesdays, led by a professional iconographer, Efthinios Stoyja. An immigrant from Albania, he has also created many of the icons at St. Sophia Greek Orthodox Church in Albany and churches in Boston. He teaches in the Macedonian style of Byzantine iconography.